Marie Sharma, student of Idhaya College, Pondicherry attended our "Freedom from Corruption" campaign, was stopped by policeman and was asked to produce license and registration of the vehicle. Inspite of producing them, the policeman asked her for a Rs.50 bribe. She then, handed over the Zero rupee note and the policeman smiled and pretended as if nothing happened and let her go. 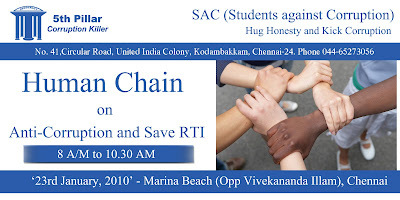 On January 23rd, 2010 5th Pillar conducted a Human Chain with the theme “Hug Honesty, Kick Corruption”. The objective of the human chain was to campaign against corruption and appeal to save the RTI Act. The event was attended by students from various colleges all over Chennai and also included 5th Pillar coordinators, members and the general public. It started at 9:00 am at Marina Beach in Chennai. Dr. Ln G. Manilal, district Chairman of Lions Club, kicked off the event by signing on 5th Pillar’s mega sized(30 feet long) Zero Rupee Note Banner, bearing the statement “I will neither accept nor give bribe”. Then the remaining public signed on the banner with great zeal, as a token of their dedication against corruption. “We have mainly targeted college students as they are the future citizens of the country. Some of them who get into politics will have the values of “the greater common good” imbibed in them and help India get better by the day”- said Mr. K Nagarajan, the legal advisor of 5th Pillar. To further their appeal for a corruption free society, they laid thumb impressions to justify the slogan- “Without ‘I’ there is no Corruption” and “Hug Honesty & Kick Corruption”. A signature campaign made on a larger version(9ft x 6ft) letterhead of 5th Pillar, signed by all the students appealed to the Chief Minister and the Deputy Chief Minister of Tamil Nadu to enforce stricter punishments for corrupt officials and to save the RTI Act from losing its power by poor functioning of the State Information Commission. The Zero Rupee Note has proved to be the mascot of 5th Pillar, and helped many a citizen to obtain his/her fundamental right or a certificate from a government department, without having to pay a bribe or wait inordinately. Hundreds of Zero Rupee Notes were distributed to all the students who were seen holding them high and taking the Anti-Corruption Pledge that they would “Neither Accept Nor Pay Bribe”, and would help every fellow citizen to “Eliminate Corruption from All Levels of the Society”. Jayaselvan, Dilip Kumar and Jeevan. The event was also an act to seek government support to help eradicate corruption from its very roots. 5th Pillar was part of a training programme organised by ANITHRA at Deenabandu Nagar, near R.K. Pet and Tiruthani of Tiruvellore Dt. Around 20 NGO' s from the districts of Kancheepuram and Tiruvellore participated in the training program which went on for a two days the 24th and 25th of January, 2010. Mr.Banukumar , Executive Director and Ms.Sumathi, Director public relations of 5th Pillar were the trainers on the first day of the training and Mr. Jeyaselvan, RTI coordinator of 5th pillar conducted classes on the second day. The participants were educated about the Panchayat, its role in society, Gramasabas, their role in formulating plans for the development of the villages, the role of the panchayat members and the President, their accountability in society, the various groups formed in the panchayat on specific subjects, periodicity of tne meetings . the number of meetings to be conducted etc. The members were also informed about the application of RTI for getting the grievances redressed , the method of writing RTI , the appeals etc. The training programme was found to be very useful for the NGO's who participated in the training. Zero Rupee notes were distributed to the members who participated in the Training. 5th Pillar, Anti Corruption Movement, Lanjam Kodadhor Iyakkam and few other organizations signed this petition to remove the State Chief Information Commissioner and submitted to the governor. The draft of the petition is as follows. Information commission. Using the Act we have been trying to elicit information from the Information Officers of the various Public Authorities and in most of the cases no reply is received in time or the reply given is not relevant. After this the first appeal is preferred and in almost all the cases the appellant authority is also not responsive, which necessitates a second appeal to the Information Commission. Many petitioners approach the Tamilnadu Information Commission with the fond hope of getting redressal. But, alas to their dismay they find that the Commission is no better than the errant .Public Authorities. Briefly put, the Commission which has to impose penalty for non furnishing of reply within thirty days by the Public Information Officers itself takes a long time, even a year and more in some cases, even to read the petition, let alone dispose it of. Consequently the Commission finds itself lacking moral authority to impose the mandatory penalty as per the Act, for delay by the Public Information Officers. This has emboldened the Public Information Officers to continue to be indifferent and has resulted in the public flooding up the Commission with lakhs of petitions. The Tamilnadu Information Commission has the dubious distinction of getting the highest number of appeals in the country.. Various NGOs and individual RTI activists,from time to time, have taken up the matter with the Government and the Commission. Some meetings have been arranged and decisions taken. But no follow up action has been taken The activists conducted a protest rally in the City in January 2009. A detailed memorandum was submitted to the Chief Information Commissioner and other Information Commissioners (Copy enclosed). This was followed up by meetings with them individually and collectively. But the situation has not improved and the activists and public are disappointed, that even after four years of the enactment of the Act it has not borne fruit, solely owing to the ineffective functioning of the Tamilnadu Information Commission. Based on the assessment made by the NGOs and RTI activists, it is seen that, all is not well with the Tamilnadu Information Commission. There is no coordination among the Commissioners. There are no laid out procedures for dealing with the petitions. It is said that the Chief Information Commissioner at his own will, distributes the tapals to the commissioners which is also not regular. Some times the tapals are let to pile up and the Commissioners are left to idle out. In the absence of procedures, the cases passed by the Commissioners are said to be reviewed and revised by the Chief Information Commissioner. Adverse comments have appeared in the Press, and notable personalities have also written openly on the ineffective functioning of the TN information commission. An article written by Late Thiru .A.K.VenkatSubramanian (IAS Retd) and published in the Tamil daily ‘Dinamalar” and our letter of appeal to the Government and to the Chief Information Commissioner quoting the article, are enclosed for kind perusal. On analyzing all the factors, we have come to realize that the ineffective functioning of the commission is due to the mishandling of its affairs by the Chief Information Commissioner Thiru S.Ramakrishnan IAS (Retd).. The following lapses and deviations from the provisions of the Act are apparent which have not been attended to even after bringing them to his notice. Section 19 para 10 of the RTI Act-2005 requires that “The Central Information Commission or the State Information Commission as the case may be, shall decide the appeal in accordance with such procedure as may be prescribed. .Section 15 para (4) of the act says that “The general superintendence, direction and management of the affairs of the state commission shall vest in the State Chief Information Commissioner who shall be assisted by the State information commissioners---“. Hence it is the bounden duty of the Chief information Commissioner, to prepare or cause prepared the necessary guidelines for the functioning of the Commission, even before he puts his first signature in office,. The Chief Information Commissioner has been allocating work to the State Information Commissioners at his will and has not followed any procedure. There have been times when the Commissioners have been sitting without work where as thousands of petitions were pending with the Commission. Section 25 (1)of the Act requires that “the Central Information Commission or the State Information Commission as the case may be, shall as soon as practicable after the end of each year prepare a report on the implementation of the provisions of the act during that year and forward a copy there of to the appropriate Government. corruption cannot be contained by the Act. back. This is irregular and violative of the procedure outlined in the Act.. In the circumstances we fear that, with such a shoddy approach and disinterested and ineffective performance by the Chief Information Commissioner Thiru S.RAMAKRISHNAN IAS (Retd)., the noble and laudable objectives of promulgating such an Act (Viz.RIGHT TO INFORMATION ACT-2005) by the Government t of India would be nullified and defeated . We therefore approach Your Excellency with the following submission. We request that your Excellency may consider our representation and in the only interest of successful implementation of the RTI Act-2005, benefiting the citizens and the entire Nation, order such action as deemed appropriate by Your Excellency. The speaker for the second day of the course was Mr. Ilango, from Kuttambakkam village near Arakonam. He is a Chemical Engineer, who graduated from IIT Madras and after working a few years in the submarine decided to return to his native village to elevate the living standards of the people. He spoke about the projects he undertook and the practical difficulties he had to overcome to achieve success. He was an inspiration for the young as he was able to act on the social issues. The afternoon session was conducted by Mr. Arumugam who spoke on the topic of Parliamentary Activities. He discussed about the topic, "Why educated keep away from the polling booths?". He attributed many factors to this like, frustration at the existing political and governmental setup and governance, no alternative to the existing two or more political factions, exercising money and muscle power to sway the illiterates, and by misleading the illiterates by creating an illusion of merging the celluloid and real life as one. The evening session was initiated by Mr. James, who spoke about “ Role of youth in bringing Political Innovation”. He explained, how the current political climate discourages the youth in all aspects of attaining their full potential, as Corruption plays a key factor in deciding the rightful placements in various opportunities. He believes that the youth can bring a political innovation by following the three basic principles, Awareness, Raise for social issues and Acting or participating. The children should be taught from school about our political structure and governance and encourage them to be model citizens. In order to make a change for betterment one should first understand the core principles and activities. First step would be to understand the parliamentary proceedings and about the ways in which a Bill can be passed and the functions of each governmental bodies and representatives. To this effect the instructor gave an assignment to the participants to visit their local ward councilor and get an input on the ongoing projects in their constituency. These practical assignments are very effective in understanding the topics covered in class. As a Social and Political aspirant one should be able to address the social regressions in the society and come up with possible remedies. The Youth can restore the faith in democracy by participating in the elections and by becoming a political professional. After each session there are group discussions to encourage the participants to voice their opinions about the current political climate in our country. On 16 January, 2010 5th Pillar conducted a list of activities at the preschool in Uralvaimozhi village in Tirunelveli District. K. Nayanar (Chapter coordinator), Shankararaju (Secretary), Natarajan (Organizer), convened the meeting and was attended by Jayaselvan (RTI coordinator, Chennai), and N. Sumathi (Public Relations Officer, Chennai) from 5th Pillar Chennai, and students from local school and general public. Natarajan gave a detailed outline of the activities undertaken by 5th Pillar, followed by Jayaselvan who spoke about the RTI. He explicated in detail about the benefits of the act and in situations it can be used to get things done. He unraveled a case scenario for obtaining a delayed ration card. He explained about framing the proper questions in the petition to get favourable results. The public were very encouraged to hear about the success stories achieved by writing such petitions. Sumathi, spoke on the topic of "Corruption in Society". The passionate discourse by Sumathi motivated the public and students to have an interactive session. Baskar from the village Chinnamuttam of Kanyakumari District, proclaimed on stage that he would be opening a Chapter of 5th Pillar at his hometown. At around 1 p.m. nearly 70 students from local high school, along with a few volunteers from public ran a marathon of 11km from Uralvaimozhi to Radhapuram. The organizers and the personnel from Chennai office went along the marathon route and distributed Zero Rupee Notes, and RTI flyers to create an awareness among the village community about the existing assistance available to solve their problems. Retired Head Constable Gnanasigamani, residing at 2nd Street, Mumurthi Avenue, Kaspapuram, near Tambaram was cornered to pay a bribe of Rs. 7000 by Subramaniakuram, a foreman at the Madampakkam electricity department for converting the connection from single phase to three phase current at her residence. Gnanasigamani had already paid an amount of Rs. 8000 at the electricity department and had a receipt. When she was being stalled in getting the connection, she approached the vigilance department who set up a sting operation. Place for money transfer was setup at Gnanasigamani's house. When the foreman came to accept the money he was arrested by the police officers and was taken to the Chengalpet Court. There he was sentenced to Puzhal Jail. This is a very interesting topic for debate. Are women less corrupt? Everyone who reads this article can decide based on their personal experience. The fact is some women demand and accept bribe directly, while some have mediators like male relatives or office staff who receive bribe on their behalf. Seetha Fernandes, an assistant educational officer demanded a bribe of Rs. 30,000 from an elementary school teacher Mrs.Krishnamary, of R.C Elementary school in Sendivakkam near Melmaruvathur. Krishnamary filed a complaint with the vigilance department. Seetha Fernandes was arrested by the vigilance department when she was caught in the act of accepting the money. She was produced in front of a magistrate in Chengalpet District Court and was sentenced to a jail term. For the third day of course, we had an interesting speaker who spoke about exemplary details of honesty practiced by our past Chief Minister Mr. Kamaraj. The speaker was Mr. Killivallavan, who served as the secretary for the Chief Minister of Tamilnadu Mr. Kamaraj. His lecture was an inspiration to the students and also an example that politicians can be honest if they wanted to. Mr. Arumugam spoke in depth about the Union and State legislature and about policy making and policy process. The Union legislature is called Parliament and consists of 2 Houses, known as Council of States (Rajya Sabha) and House of the people (Lok Sabha). The State legislature consists of the Governor and legislative council and legislative assembly. Governor's role and excise of power in State legislature was explained in detail. In some states the legislature is bicameral and the role of legislative council and legislative assembly was discussed. All the bills, except the money bill can originate from the council. If the council rejects a bill, and is passed the second time by the assembly, it is deemed to have passed by both Houses. Policy making, Budget preparation and introduction of Finance Bill, role of civil servants like IAS officers, in formulating and assisting the politicians to implement the policies was explained in detail. The National Developmental Council (NDC), established in August, 1952 consisting of the Prime minister, all Union cabinet ministers, Chief Minister of all states and union territories and members of the planning commission provide approval to national policies. The speaker for the evening session Mr. James, spoke on the topic of “Political Professional Opportunities as a practitioner and academician”. Political professionals are the ones engaged in a business-like service within the political system, and its origins is in the US. Political professionals consists of political consultants, media consultants, pollsters, campaign managers, corporate public affairs officers, professors, fund-raisers,lobbyists, congressional staffers and vendors. In India political professionalism has been confined to the realms of advertisement campaigns, media journalism and engagement of market research consultants, indirectly to understand the voter behavior and to influence voter decision. In the Indian political system, fund raising has been managed by political parties themselves and there is no accountability for funds. All the topics covered by the speakers help the students better understand the political system and methodology of proper governance. After getting quotes from various printing and publishing companies in Chennai, the cost to print one book is estimated to be Rs.20. Hence the cost of printing 25000 books = 25000 * 20 = 5 lakh Indian Rupees or $12,500. Time: 8 A/M to 10.30 AM. Venue: Marina Beach -Opp Vivekananda Illam. Number of participants: Over 1000 anticipated. Target Group: Students, NGO's and the general public. VIP's: Senior Police Officers from Tamilnadu Police Department. Popular Cine stars from Tamil Screen. "Let us Join Hands to KICK CORRUPTION out of our life"
Around 50 Educational Institutions have been contacted to depute their students NSS Coordinators have been requested to send their member students. Police Permission has been obtained. Sponsors have been contacted to meet the requirements of Certificates. Senior Police invited to inaugurate and preside over the functions. NGOs in the neighbouring Districts have been requested to participate in the event. Certificates will be issued to the participants. Membership enrollment drive will be conducted on the site. Apart from educating the common man and creating awareness about the ill effects of corruption to eradicate the social evil we are working towards encouraging and empowering the youth to take active part in Politics. Without accountability at all levels of office, containing corruption is not possible. Hence a few of us like minded organizations have come up with a program to train individuals with a passion for Politics through the " ACADEMY OF HONEST POLITICS"
The ultimate aim is to cleanse the political arena and Governmental administration of corruption, nepotism, and inefficiency ensuring better governance leading to over all peace and prosperity of the country with equitable distribution of wealth to all sections of the society, irrespective of caste, creed, religion, or social status. The resource personal will be a team of well known politicians, well versed administrators, professionals, disciplined police officers, elite members of judiciary, college professors, lawyers, noted historians, famous artists, sports personalities. Consumer activists, social workers, business men, well the list is end less. Obviously these men should be of impeccable integrity. The first batch of training has been kick started on 2nd January 2010. The course is scheduled for Saturdays from 10 am to 5 pm which goes for 12 consecutive weekends. Each Saturday we have one eminent speaker to talk about relevant political issues. So far there are 21 participants for this course and the registration is free. On 5th December, 2009 an RTI training was conducted in the Chennai Office. There were 12 participants and the participants were trained on how to file an RTI petition. This is a starting point as these trained individuals will be able to help the fellow citizens in their community to file similar petitions and educate them about RTI Act. This is one way to empower our citizens and to propagate our mission into the society. Vijayanand initiated a group discussion among the participants which helped them in understanding the issues in different perspective which in turn motivated them further to fight for the cause. On 12th December,2009 another RTI training was conducted in the Chennai Office. There were 6 participants, and the meeting was conducted by the Executive Director Mr. Banu and Vigilance coordinator Mr. T. Jayaselvan. After the training session they got the feedback to see if there is a need for improvisation. This commitment is vital for the growth of the organization. During this sessions the participants are trained to write their petition by themselves. This will empower them to file other RTI petitions. On 26th December, 2009 we conducted another RTI training session for 15 participants at Chennai Office. The session was very interesting as all the participants had stories to say about their past experiences and the discussion was very fruitful in coming to a conclusion about how to face the similar situation in future. Many of them said that they were angry but did not know what to do. At the end of the session they all felt that they can best handle the situation by silently walking away from a volatile situation and then counteract with the powerful tool of RTI. These RTI sessions are very interactive and each participant is educated to write his/her own petition. By doing this the participants get adept in writing petitions which will further motivate them to resort to RTI when the need arises. We are trying different methods to create an awareness among the citizens. Visual media is a effective method to reach the people. In effect to this on 1st of December, 2009, we were able to get the attention of thousands of viewers through the program televised by Jaya Plus TV, explaining in detail about the RTI Act, ways to apply and expected results. President of 5th Pillar, Vijayanand explained about the RTI training we conduct in our Chennai office periodically and encouraged the viewers to attend the training and get equipped with the expertise to write a petition. He gave a few examples of the success stories to motivate the viewers, that it is possible to get results without bribing. Next time if we can have interactive session were the viewers can call to ask questions it would be more effective where we would be able to give practical solutions to boost their morale. After the televised program we received a good number of calls asking about our organization. Some of them passed by the office and joined as members and subscribed to our monthly magazine "MAATRAM". Some college students who came to our office were very enthusiastic and volunteered their time for some of the activities. It is very encouraging to see that the student community is very eager to bring a change in our society.